We had just finished taking my grandchildren on a wild tubing excursion. For over an hour we trolled the lake looking for boats that made monster wakes, the kind of wakes that could get screaming children on a tube airborne. The children’s laughter echoed across the lake and lifted my soul. Then out of nowhere it happened. We were headed for our dock at idle speed. Of necessity we had to pass another dock. As we crawled at a snail’s pace and a safe distance past the dock, populated with watchful adults and laughing children, we waved our greeting. No smiles, no acknowledgement of any kind other than a tiny timid wave from one older woman. “Hello,” I shouted. And waved again. I confess! I lost it!!! For ten years we have enjoyed creating memories on this lake. Never have we encountered such unreasonable belligerence. I guess I should have been wearing my “What Would Jesus Do” bracelet but instead I was wearing a pair of Nikes emblazoned with “Do it!” I confess! I did it! The next moments were spent verbally responding to the outrageous arrogance I was witnessing. I used no profanity, but I gave this man a tongue lashing that left him covered with saliva. I confess I do not handle sudden unexpected conflicts well. The motorist that flips off my wife (she usually drives) for no apparent reason and the man using a stream of obscenities in front of my grand children do not get a free pass. How do you deal with them? The slow simmering interpersonal conflicts. I tend to avoid conflict at any cost. AND I am beginning to believe that the cost is high. I know that conflict is a part of every relationship. I once had a man tell me he had been married for over forty years without a single moment of any kind of conflict with his wife. Hoping he understood the humor in my response. I said, “Either you are married to a carrot or one of you passed away early in the marriage.” Every relationship will eventually involve conflict. I grew up in a home where conflict was not allowed to be expressed. Questions were not to be asked. Topics of contention were never discussed. Opposing opinions were never allowed to be debated. That may be why today I relish intelligent and vigorous debate between people who can disagree on politics or religion and still walk away friends. But that’s not conflict. That’s fun! Interpersonal conflict is another matter. Therapy has taught me where some of my reticence comes from. Therapy has not yet totally helped me deal with this kind of conflict without great emotional distress. Maybe you can help me grow. So here are the sincere questions I have for you. I want to hear how YOU handle these situations. Am I the only one who has difficulty facing conflict? Do you feel it is ever legitimate to let a person know that their actions are unacceptable? Because of the irrational response of the dock screamer, my family refused to let me go over and try to reason with him. Is there a time when wisdom dictates to stop casting pearls to swine and walk (or slowly motor) away? How do YOU handle conflict that arises when expectations of your family, team, or friends are not met. How do YOU and your spouse handle conflict resolution? I think I know you well enough to know that you really do “give a damn.” Maybe we care too much. That’s what my daughter said to me. I want to please everybody. I also hope that after a brief time you will (Unisolate) and get back out there. You have been a tremendous encouragement to me and many others as well. Caring hurts, but not as much as isolation. So from a very imperfect guy without all the answers, there is my response to a guy i have grown to love over the years. You can keep your quarter cause I care about you! Outstanding post Ken around an important topic. I’m with you…conflict is an inevitable part of relationships and the key is managing ourselves and our responses. And there’s a great chance my response to the situation would have been similar, so I’m not sure I can offer any stellar advice. 1. What caused the conflict? 2. What did I do to escalate or calm the situation? 3. What did I learn that I will apply next time? As I sit here in the family court waiting room wondering if what I’m doing here is correct… God responds. Ken I totally avoid conflict. I use silence instead of dealing with issues. It took my wife to teach me that, to deal with conflict. I find simply having the courage to step out of my safe environment is enough to bring about a resolution. God will provide the words and the actions. If not he will provide the forgiveness. Thanks for this post it was encouraging. I have discovered something that has revolutionized my life in this area. Although I have been a Christian since I was in 4th grade, I had a huge anger issue due to abandonment issues and lack of attachment as a small child. It appeared as mostly reactive, especially when I was afraid or hurt by someone, and I didn’t know what to do about it. I knew that this Christian life had to have some ANSWER more than just PRAY ABOUT IT. Then someone introduced me to Life Model Works and Joy Starts Here. Dr. James Wilder, a neurotheologian, has written about the way the 2 sides of our brain work together for best possible outcomes. If we are not trained in these brain models, we will have to have remedial training later on. (I started at about 60!!!). The exercises they teach help us: 1. BUILD JOY so that when crisis and conflict occur, we can still ACT LIKE OUR TRUE SELVES, made in Jesus’ image; 2. Return to JOY from those big emotions that are hardwired into us; and MORE. I recommend Dr. Wilder’s book, The Complete Guide to Living with Men. It is not just for women!! It has the clearest explanations of brain work, and how we can find the healing God has for our brains and relationships. You can check out Dr. James Wilder on YouTube as well. Some of it is older, but information is great. You can find good stuff too in JOY STARTS HERE. This book contains JOY assessments which are quite helpful. Thank you for your candor. I believe many, many Christians are unhappy, unfulfilled because we still mostly FEEL alone, even though in our heads we know He said, “I will never leave you.” What we have forgotten is Paul’s assertion that: The same Spirit that raised Jesus Christ from the dead lives in you!!! And we don’t know how to live with that…because of our past pain. A few weeks ago, I went to check out a school for a tour. I was not able to get a tour and was heading back out to the car. This man was yelling at me for the way I parked, I was on the corner and blocking a sideway. He was swearing and flipping me off and acting this way in front of his son who had to be somewhere around the age of 9. He told me I should be ashamed for the way I parked. I do not handle sudden conflict well and my response was “No, the only one who should be ashamed here would be you. Yes, I may have blocked a sideway. However, you have flipped me off, sweating and acting in such a matter that frankly, your son here should never see. I also told him you catch more flies with honey than vinegar. He began to yell some more.” I told him,” Have a great day.” I got inside my car, locked the doors. I drove away thinking that is man speaking and behaving this way says more about the kind of person he is. Even though, I was fired up. I kept telling myself this. It seemed to help. Hi Ken! First off, my family first met and heard of you on an Inspiration Cruise where you were with several other comedians (Tim Hawkins, Bob Smalley and others). My wife and I took our kids to celebrate our 25th wedding anniversary. It was very enjoyable! Strangely enough, I thought I was the only one who was raised in a “no conflict” environment. I would like to see the responses you get to this post! Jesus blesses us with wisdom-James 1:5. I have spent most of my adult Christian life allowing people to talk rudely to me because I HATE confrontations. I try to let it go thinking they must have a sad home life and they needed to vent. I also give it to the Lord in prayer so it doesn’t turn into bitterness as I try to be His example. But, since I am far from perfect I have spoken sternly to others but not in anger. I think that’s where God draws the line and I doubt He wants others to walk all over us or to be taken advantage of because we are Christians. When I have over stepped my bounds I do feel the Holy Spirit directing me to apologize. Handling family conflict has been the most challenging, difficult and the most hurtful. Sorry to admit I go silent but that doesn’t resolve anything but I am an introvert and like I admitted I HATE confrontation so I pray. I couldn’t find a Biblical answer concerning this matter so now I need to know what you think Ken. Have I been handling this all wrong? I would react the same way. I’m not good with conflict, I’m a really nice person, caring, giving, laugh alot,… But O was brought up the same way where you never ask questions, kids were to not to be seen or heard. Always wrong go to your room. So I’m not good with confrontation. With God’s Grace trying to love others and just consider the source , not saying it won’t happen again but trying. I recently had a conflict with my 50 yr old niece on fb of all places. She said I was judgmental. I told her I try really hard to not judge others and I was sorry she saw me that way. She said she knew I didn’t mean to be but sometimes I come across that way. Believe she was referring to one previous incident on fb…the one and only time we conversed and I was conversing with her son, my nephew at the time. Problem is that she is a manipulator taught by her parents who are manipulators. I decided to block her fb postings. I am a born again believer and I am OK in God’s sight. Thats what counts and I’m sticking to it!!!!! 🙂 Sometimes I am called upon by her family to make a judgment call….but they conveniently forget to give me all the facts. Set up big time!!!! I am lucky to live 500 miles away from them so I don’t have to get involved in their life situations. It’s a long story and no room to post here all of it here. God’s in charge and that’s all that counts!!!!!!! He will take care of it because He is the controller!!! QUESTION: Why does your wife usually drive??? No, you’re not the only one that reacts this way, I do, too, then tell the Lord, I didn’t handle that too good, did I? BUT, I do think it’s okay for you to let people know when their behavior is unacceptable, especially if it’s with small children/grandchildren in close proximity. I usually get this sort of treatment with my mother, who is just cruel & hateful, but it’s usually in letters. I highly recommend to anyone the book by John Bevere “The Bait of Satan”. That gave me a clear view of how the enemy was using my mother, and then subsequently my younger son, to get to me! Once I knew the game he played, I refused to play it anymore. Sometimes those times, like you had, may be testings…I believe that to be true when it’s rare but have to have a personal encounter with my mother…I just let her yell….and the letters? I don’t answer them, I just write my own “stuff”, because if I do, I got back on the merry-go-round with the enemy again. It’s difficult when you are in the midst of a situation, but it helps to quickly whisper a prayer for God to show me the bigger picture here, and that’s the enemy orchestrating it all. I no longer get angry at my mother’s letters, I feel sad for her and then I again, give her to God, and ask Him to carry out His will for her in her life, in otherwords, You take care of her Lord and as for me I pray He just keeps my eyes on Him. It works!! In my 46 years of marriage, the only conflicts that escalated were ones in which I knew I was right. That ended several years ago when I DECIDED that I didn’t HAVE to be right. Much easier! As to conflicts with others, my solution is to back away and send my wife! There is no like button, but if there were, I’d have to get stuck on it! Great solution! I’m afraid I wouldn’t be much help as I do not enjoy conflict. I tend to internalize everything until I’m at the exploding point. I usually explode, rediscover that exploding does me no good and start the process over again. There are certainly times when I immediately get angry like idiot driving or rudeness while driving. Rarely will I bite back when someone is verbally abusive to me but if someone was rude to my mom and dad before they passed away I could quickly go off the deep end. Mostly I try to stay cool and ask the Lord to help me do so. I recently was driving on one of our busy highways. The traffic was bumper to bumper and a black VW cut me off. The woman wanted to change lanes causing me to slam on the brakes. I honked the horn and she stuck her hand out of the window middle finger straight up sporting a green finger nail. I said to my wife ” that is not a nice lady”. My wife replied” That is not a lady”. I Really enjoy such Practical- Life-based questions and scenarios. I also used to avoid conflict at any cost, which mostly included me walking away hurt and angry inside. I could be so upset that it would ruin my whole day. But gradually i begun to realize that telling people how i feel about their conduct doesn’t make me a bad person, but rather it can help in fostering a better relationship. For me, i think i didn’t want to confront people because i also didn’t want people to confront me with my mistakes and faults. But i have learnt and continue to learn that we are all WORKS IN PROGRESS. With time, God’s perfection will be made complete in us. i can’t open this It is causing me conflict! I encourage you to keep the swear words off your page. If that is what was so offensive that this lost soul did in front of your grandchildren, I wouldn’t want them to their redeemed granddaddy condoning it on his page! Mt 5:9-16 “Blessed are the peacemakers: for they shall be called the children of God. Blessed are they which are persecuted for righteousness’ sake: for theirs is the kingdom of heaven. Blessed are ye, when men shall revile you, and persecute you, and shall say all manner of evil against you falsely, for my sake. Rejoice, and be exceeding glad: for great is your reward in heaven: for so persecuted they the prophets which were before you. Ye are the salt of the earth: but if the salt have lost his savour, wherewith shall it be salted? it is thenceforth good for nothing, but to be cast out, and to be trodden under foot of men. Ye are the light of the world. A city that is set on an hill cannot be hid. Neither do men light a candle, and put it under a bushel, but on a candlestick; and it giveth light unto all that are in the house. Let your light so shine before men, that they may see your good works, and glorify your Father which is in heaven. Yes, easier said than done! It is easy to respond in the flesh, and snap back…I know! But I encourage you to remember, you claim to be one of God’s dear children. How are you shining for him? 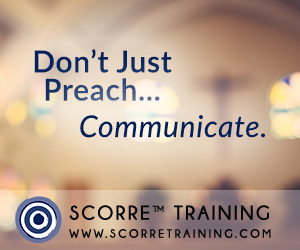 Are you answering back in a way that will bring glory to God, and encourage this soul to see a difference, and desire a personal relationship with God? Where in the world did you see a swear word???????? Depends. If you don’t know them, and will probably never see them again, your opinion probably won’t count for much (unless it’s something serious, then a stand needs to be taken…ambiguous?) If it’s someone close, I’d say yes. A teaching moment. Also similar to getting liver for dinner and saying mmmm…good! You’ll probably get it again. Probably so. My wife will often remind me that I need to be the grown-up. My reply is usually “I don’t want to be the grown-up”, but I will usually concede to her. She’s a pretty smart cookie. Mostly just pout. Or make suggestions. Really, it kinda goes back to the grown-up thingy. We pretty much decided early on what was important and what really wasn’t (Money- have, not have. Toilet paper-under, over. Toilet seat-up, down.) It’s worked pretty well. I must understand that she is my mentor (tor-mentor) and her levelheadedness often wins the day. I have to admit that most near conflicts come from me (and the daughter…but that’s another story), and the phrase I hear most is “you didn’t think that all the way through, did you?” We have a lot of love between us, and trust. When I get too grumpy she will usually tell me to go ride my motorcycle for a while. Your comments on my last blog post were extremely helpful. I look forward to your respectful and thoughtful responses. Reading how you handle conflict will likely help me continue to move forward. BTW Has anyone seen my WWJD bracelet? The bracelet is probably on eBay by now. Do not like.conflict.of any kind. I will defend my family. 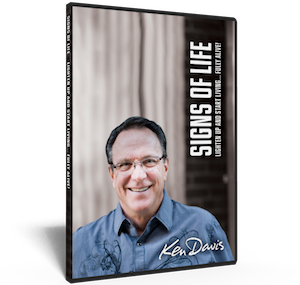 Sign up to receive my blog posts and get a free download of my DVD, Signs of Life. 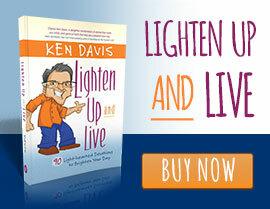 Ken Davis is one of the country’s most sought after motivational and inspirational speakers. His mixture of side-splitting humor and inspiration delights and enriches audiences of all ages. 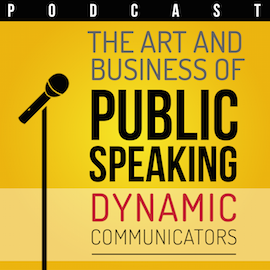 Ken speaks to audiences around the world including corporate events, local church events, community comedy concerts and more. Living a life fully alive in Christ. Learning to lighten up… and live!